Named for a Chinese martial arts ceremony, Bai Shi combines an oriental theme with majestic animal imagery to produce a game which is as easy on the eye as it is generous to the wallet. The game, after all, adds a really impressive top payline jackpot, stacked wilds and free spins to its fun and attractive theme to ensure that it is a five reel and four row slot that many players are certain to adore. At the highest possible bet level, the Bai Shi top payline jackpot is worth a truly life-changing £100,000. The white lion wild featured in Bai Shi appears stacked on all reels that it frequents, meaning that it succeeds in delivering impressive wins far more often. Payline wins below the top jackpot remain at impressive sizes. Players have excellent control over their staking amounts as they can alter both the active paylines for a spin and their line bet. There is no bonus game or extra feature to add further interest to gameplay. Due largely to the above, gameplay is very simplistic and repetitive, and may lead to some players getting bored. Featuring five reels and fully four rows, Bai Shi is a slot which delivers its highest payline jackpots when players see five matching symbols line up across an active payline. The highest jackpot of all, therefore, results when it is five of the slot’s most valuable symbols which so appear. That most valuable symbol is the white lion wild, which pays at a rate of 2000 times the chosen line bet, when five of them align on an active payline. Were a player to select the highest possible line bet of £50, then, the resulting jackpot would be worth a rip-roaringly impressive £100,000. Whilst it is a comparatively straightforward slot game, Bai Shi does include a couple of additional game features. These are its wild symbols and its scatter symbols, which serve to trigger valuable free spins. 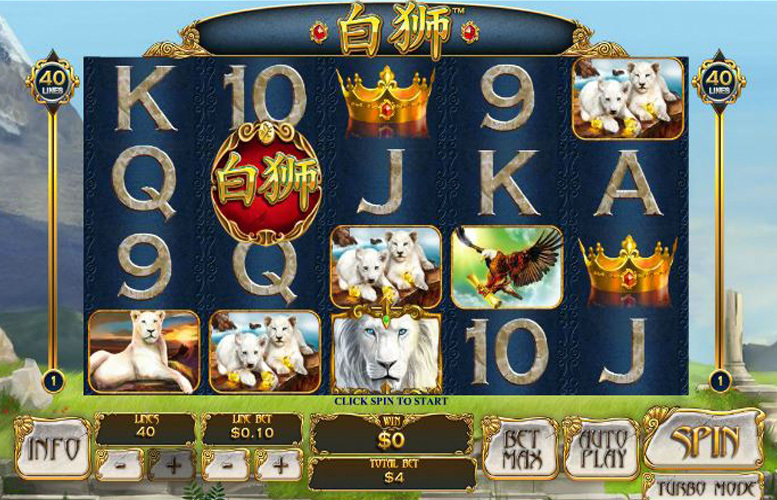 Depicting an image of a majestic white lion, Bai Shi’s wild symbol does more than simply make up the game’s most valuable payline combinations. It also substitutes for all other symbols – bar the scatters discussed below – in order to make up the most beneficial possible combinations for each spin. What’s more, when the symbols do appear, they become stacked in order to cover the whole of the reel they appear on. Alongside the slot’s wild symbols, the other type of special symbol featured on the Bai Shi reels is a red scatter showing off the Chinese characters for ‘white king’. 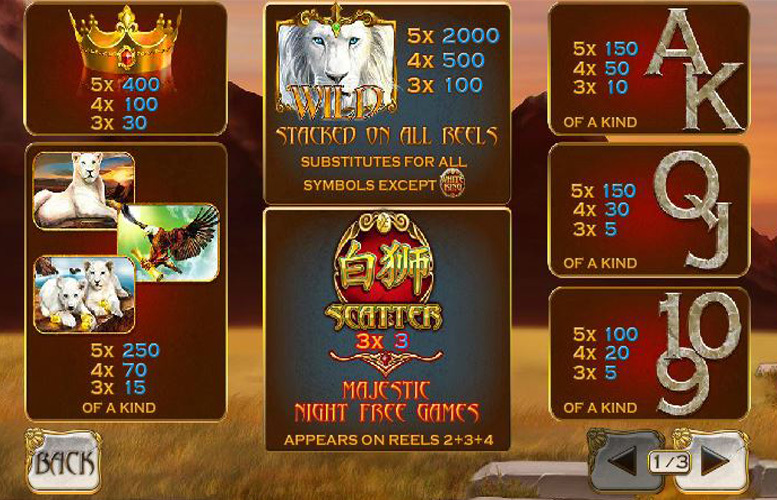 Those scatter symbols appear on reels two, three and four, and if three appear at once players receive an instant win worth three times their total bet and five ‘Majestic Night’ free spins. 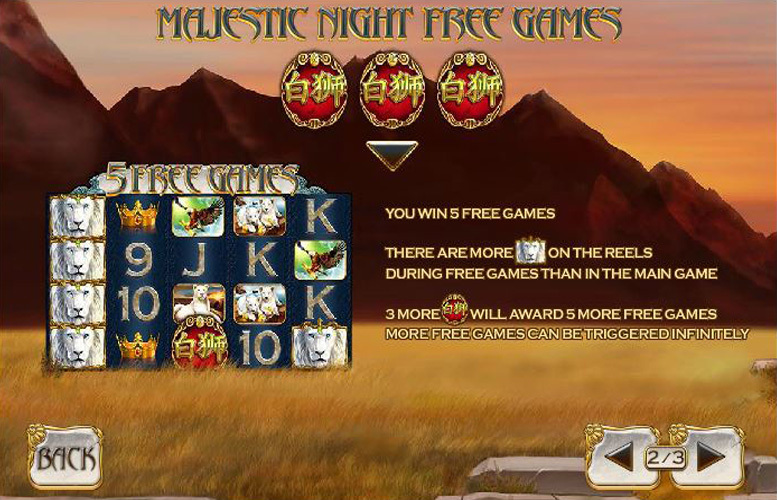 The five ‘Majestic Night’ free spins are played on reels which include more wilds than the usual reels and players can trigger further free spins whilst playing those which they have already earnt. Aside from the special symbols described above, the others on the Bai Shi reels are generally a combination of animal symbols and symbols depicting characters from the Chinese alphabet. After the white lion wild, however, the most valuable of the symbols is that which depicts a golden crown. 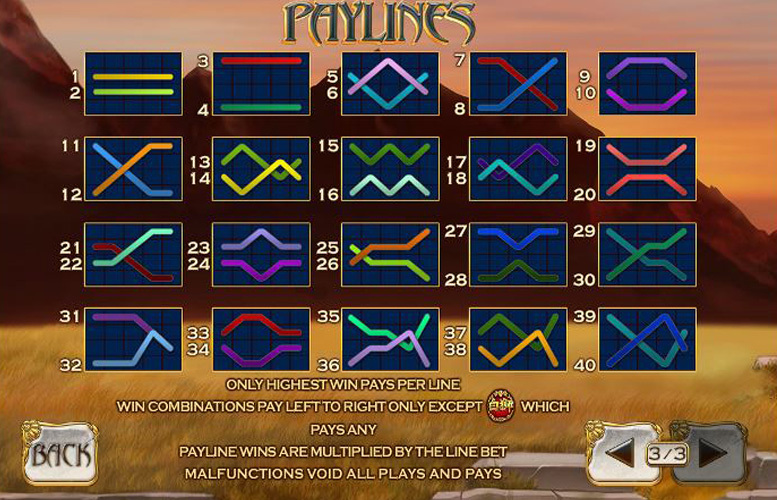 If five of the crown symbols line up along an active payline, players receive a payline jackpot worth 400 times their chosen line bet. If five of a kind of any of the game’s three other animal symbols (the lioness, lion cubs or eagle symbols) appear on a payline, meanwhile, the resulting payout will be worth 250 times the line bet. Bai Shi provides its players with an excellent degree of choice when it comes to how much they wish to bet per spin. Those players can, after all, alter the number of paylines which are active for each spin and how much they wish to wager on each payline. The slot has a maximum of 40 paylines and players can activated anywhere from just one all the way up to that 40 for each spin. There are almost as many line bet options, too, between the minimum possible 1p and the maximum of £50. What all of that means, then, is that the minimum possible bet per spin in just 1p and the maximum is a lofty £2,000. Taking an innovative oriental style and adding attractive animal images to produce a unique theme, Bai Shi is a slot game with a lot of impressive features. Firstly, one can’t fail but be taken by its striking and yet simple appearance that allows it to be easy on the eye without confusing gameplay. That gameplay itself, too, is very easy to understand but on the negative side can also get quite repetitive and staid. That is because the game does not feature a bonus round to add any extra interest. It does, however, include stacked wilds and scatter symbols, which can trigger valuable free spins. Those additional features, therefore, help to improve winning potential even if they don’t add a great deal to the gameplay itself. Add all of that to the slots excellent array of staking options per spin and the result is a slot which is perfect for those players looking for an attractive and a simple game with high payouts. This game has a rating of 4 / 5 with 427 total reviews by the users.